OSHA’s e-Tools are a good online training resource for employers. The modules are interactive and illustrated, and currently cover a range of more than 30 industry-specific safety topics. including two in Spanish. Some of the newest additions include baggage handling, computer workstations, machine guarding and Legionaire’s disease. The likelihood of contracting hepatitis C from a single, contaminated needle stick is small, perhaps 2 percent or lower. But the number of accidental needle sticks and other skin punctures each year is high – 380,000 to 600,000, according to the Occupational Safety and Health Administration. Still, many workers have little hope of getting their treatments or doctor visits covered – much less lost wages – when hepatitis C renders them disabled. The problem: a patchwork system of state workers compensation laws that were created to deal with broken bones, not hepatitis C.
Jottings by an Employer’s Lawyer is the latest addition. It’s maintained by Michael W. Fox, a Texas attorney who specializes in labor and employment law. He offers some interesting news and pointers to regional and national issues. in the workplace and in employment law. For the labor point of view, check out Confined Spaces by long-time labor leader Jordan Barab. Not surprisingly, his blog has a heavy focus on health & safety issues – he’s a veteran safety consultant and served as a special assistant at OSHA. 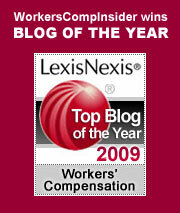 Know of any other weblogs about workers compensation-related issues out there that we should add to our list? Weblogs have taken much of the on-line community by storm, and there’s a growing roster of good health-care and legal blogs out there now…but there aren’t too many insurance blogs yet! The entire Nov. 3 issue of Business Insurance is available online this week – viewable and printable in a PDF version. This was in response to the fires in southern California which were expected to cause a delay deliveries to some subscribers. One of the front page stories reports on the fire from an insurance perspective. And worth checking out: the winners in BI’s 3rd annual “Best of the Web” feature. Our industry has hardly been an online pacesetter, but perhaps we are seeing some progress. By the way, the BI site is worth a click in your weekly industry web surfing – it features fresh insurance news links daily.